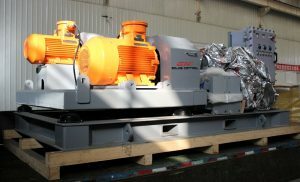 A Middle East client ordered some Fully Hydraulic Driven (FHD) Decanter Centrifuges from GN Company, with centrifuge feeding pump. 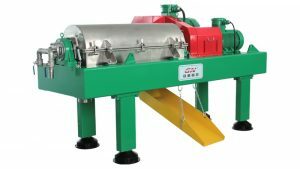 Fully Hydraulic Driven Centrifuge is driven by Hydraulic Pump with two units of hydraulic oil circuits, one for Bowl drive system, one for Scroll drive system. GN Company can manufacture and supply FHD centrifuge with bowl diameter from 9 ~30 inch, and provide professional Centrifuge Feeding Pump with 10~90 m3/h, 4~22 Kw. 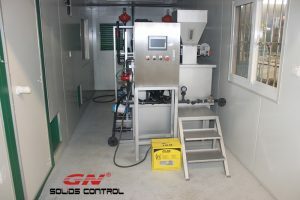 GN worked together with the reputable centrifuge hydraulic driving system manufacturer from Switzerland for developing this fully hydraulic system, in order to reach the requirement for high standard from the international market and the high-class market in China. 1. Centrifuge, Hydraulic Driving System, and Control System is installed in one skid, and it can be easy for rigging up. 2. Operator can control centrifuge with PLC system, which is easy, smart, and with safety protection. 3. The bowl and scroll is processed by high precision CNC machine and balanced by advanced balancing machine. Performance is stable and maintenance is less. Centrifugal casting technology makes the bowl material much denser to avoid bubble. Welcome to GN Company for more technical specification and working video. Before there is a friend from India, we met each other in local exhibition, he said that he ran a Cow farm, with more than 50 cows. Every day the biggest problem for him is how to deal with the huge amount of excrement? He couldn’t find more space in his farm to bury these excrement? It is always a big headache for him. Then I suggested him, maybe he can consider about our product, Decanter Centrifuge, the hot sale separation from GN Solids Control. This special and professional can easily separate the Solid and Water. At first, he didn’ t believe it, then I show him an video, he was amazing and exciting. We, Hebei GN Solids Control Co., Ltd, is a leading manufacturer based in China and USA, specialize in separation equipment, include industry decanter centrifuge, solids control equipment, waste management equipment, and shaker screens.GN was established in 2007,and GN is the first API certified solids control equipment manufacturer from China, and GN products have been exported to over 60 countries around the world. GN dewatering centrifuge is working well for Tunneling in Singapore, our engineer just finished the first time installation and commissioning there and back to China. As per client’s request, our engineer can fly to the client’s site to support them for the first time installation, commissioning and training. 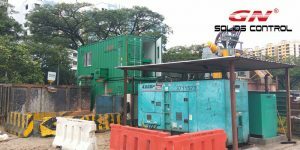 If the equipments will work well or not, it will mostly depend on the proper maintenance and operation, we will train the client’s engineer how to operate it and how to do the maintenance. 3) 20ft container with windows and doors. 4) Netzsch brand screw pump as the feeding pump of decanter centrifuge, which is the ideal feeding pump to control the frequency to control the flow rate, compared with centrifugal pump and slurry pump, it works more steadily. 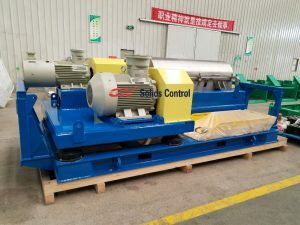 Before feeding to the decanter centrifuge, we suggest the client to use a screen/ filter or high G drying shaker / desander / desilter before the dewatering centrifuge system, the purpose is to prevent course solids enter into the centrifuge and the screw will be damaged and centrifuge will be blocked. The core components of the centrifuge is the screw, GN centrifuge screw is completely made by stainless steel, and protected by tungsten carbide tiles, the fluids distribution port is protected by tungsten carbide alloy for wear resistant. 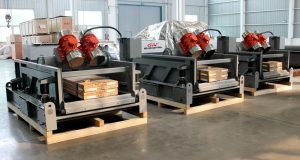 This week GN shipped one set of containerized drilling cuttings treatment system and several units of shale shaker to Russia. This is not the first containerized drilling cuttings treatment system sold to Russia, because of the low temperature in Russia area, the client do not want to stop operation in the long winter, this customized design is to keep the drilling fluids warm and prevent it from get frozen. 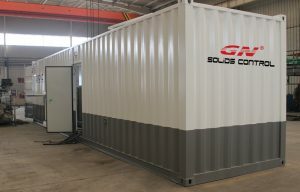 The containerized drilling cuttings treatment system including one unit of vertical G dryer with fluids collection tank, one mud agitator installed on top of the collection tank. The centrifuge feeding pump transfer the mud from fluids collection tank to the decanter centrifuge to separate more solids from the fluids, the final discharged solids can be reused for the drilling rig or used to prepare for new drilling fluids. The solids discharged from the vertical G dryer is with OOC < 5% like powder, they will be transferred by the screw conveyor to the cuttings box outside the container. One unit of 4kw screw pump is used as flashing pump of the vertical G dryer. 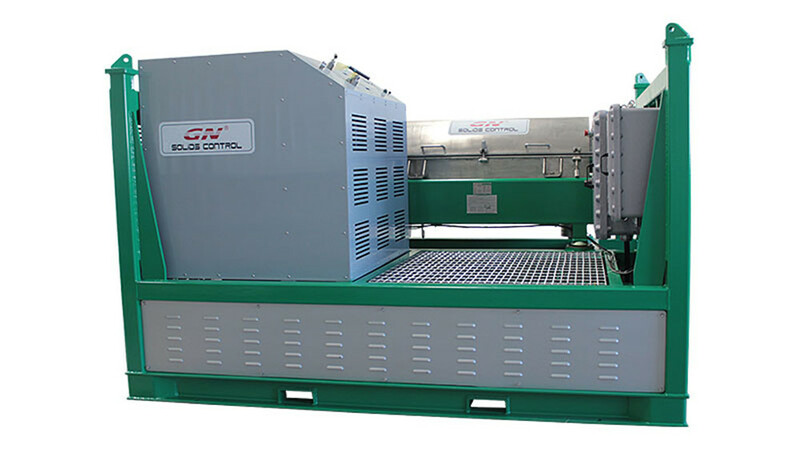 The whole drilling cuttings system treating capacity is 40m3/h for oil based drilling cuttings, the decanter centrifuge with VFD control panel can be used to separate the fine solids from the fluids, the separation cut point is 2~5 microns. The client also ordered several units of GNZS594 shale shaker with 4 panel composite material frame shaker screens, the screen size is 585x1165mm, the total screen area is 2.73m2, the G force is high up to 7.5G.